Moving material though a process falls into two main categories: conveying and feeding. Understanding the difference ensures correct conveyor selection. The proper selection and sizing of a conveyor is critical to successfully meeting production goals in a batch or continuous processing application. The decision between one conveyor and another often comes down to envelope – how much room is available to install the equipment or device? Site engineers invest a great deal of time and energy researching process equipment types and making sure the right technology is applied to achieve the precise results they are aiming for. However, when it comes to choosing a conveyor to transfer the product from one process to the next, there is a tendency to proceed somewhat less carefully. Often engineers fail to recognize how selecting the wrong conveyor can compromise the very product quality, efficiency, and system reliability they worked so hard to obtain. Ending up with the right conveyor doesn’t happen by accident. In truth, many of the same operating conditions and selection criteria used to select process equipment should be taken into consideration when selecting and designing a suitable conveyor. While the exercise deserves much more thought than is often given, it need not be a daunting undertaking either. Conveyor selection might seem to be as simple as matching up the material being moved with distance, speed and the limits of budgetary considerations. In reality, it is never that simple – especially if you intend to get it right the first time. The task of selecting a conveyor involves a systematic evaluation of the many variables which impact its operation, as well as the specific operating objectives prescribed by the process engineers. In doing so, one should never underestimate the impact of the surroundings or the potential for downtime. Of course, budgetary guidelines impact every decision but the most appropriate conveying method should account for every threat (cost) to the system’s operation and factor precautionary measures into the design. Without these considerations, it doesn’t take long for downtime, unplanned repairs, employee safety issues and increased waste to negatively impact the bottom line. Even the best conveyor systems – which are often required to operate non-stop for 24-hour periods, seven days a week, weeks at a time – can be negatively impacted by seemingly insignificant variables such as room temperature, vibration, humidity, and the presence of slow-acting but corrosive elements. The process of choosing the right conveyor really does start with a deliberate evaluation of six key indicators. There are several critical characteristics that comprise the material category. Some of these characteristics are dynamic and can influence (or may be influenced by) one or more of the other attributes. So, it is always best to evaluate all of these traits together. Material Name: Many materials are known by more than one name. It could be an esoteric or trade name (such as SnoMelt), a generic name (such as salt), or a chemical formula, which is defined by its primary ingredient or ingredients (such as sodium chloride, NaCl). Flowability: This is perhaps the most important characteristic to understand about any solid material, yet it lacks a single standardized method of measurement across industrial disciplines. Most often it is defined in somewhat arbitrary, subjective terms such as very free flowing, free flowing, average flowability, or sluggish. The angle of repose is also frequently used as an indicator of flowability. It is simply the natural angle or rate of incline that is observed when material is metered from a single discharge point without vibration or any effort to settle or distribute the accumulating mound. If the material is known or suspected to be a challenge because of its flowability, it may be best to send a sample to the equipment supplier for review. Abrasiveness: Like flowability, abrasiveness lacks a universal standard definition. However, there are two material factors that tend to determine the abrasive quality: material hardness, which is measurable and can be defined using the Mohs scale or Vickers scale; and particle shape, which recognizes that a hard particle having no abrupt edges (a sphere) is less likely to abrade a contact surface. Most often, abrasive materials are known to plant personnel and their experience is the most valuable measure. If a material has been found to erode other plant process equipment, an assumption can be made that the material will affect proposed equipment. Handling Form: Are the solids free-flowing or semi free-flowing, and what is the loose bulk density (lb/cu ft, g/cc, kg/cu m)? Loose bulk density is commonly interchanged or confused with specific gravity but should not be, as they are very different. Specific gravity is the weight per given volume of a substance, usually in its most natural, concentrated, unreduced solid form (with no air pockets or interstitial spaces between particles). Loose bulk density, however, is the weight per given volume of the material in its reduced, free-flowing or semi free-flowing state. Solids Composition: Is it a powder, prill, granule, pellet, fiber, or flake? Particle Size: Symmetrical solids are usually described in terms of their ability to pass through a screen of a certain size. Asymmetrical solids are usually described in terms of their minimum and maximum geometric dimensions. Temperature and Moisture Content: Material temperature is usually defined as a range (minimum to maximum), while moisture content is usually described as a percentage by weight and can provide an important clue as to flowability or cohesiveness. Note: Material Safety Data Sheets (MSDS) are often supplied with the intention of helping designers understand a material’s handling characteristics. However, the MSDS is really just a declaration of health, safety, and environmental concerns. So, while it may offer some clues, it seldom enables a sufficient understanding for how a material will behave while being handled, stored, or processed. Operation is the requirement of function and performance that a conveyor needs to satisfy. There are certain aspects of the operation that should include some detail and clarity. Fundamentally, moving material though a process falls into two main categories: conveying and feeding. Conveying is moving material(s) from one or more pick-up points and delivering materials to one or more drop points. The rate at which this is accomplished is usually fixed, and the delivery time, while important, fits comfortably within a minimum and maximum range. Conveyors are most often used as a refilling device for surge hoppers, feeders, or process equipment. Feeding generally is much more time-sensitive and process-critical in terms of the amount of material delivered. Material is normally received from a single source and delivered to a single drop point. Because of the precision with which material needs to be delivered, delivery rates usually vary, either to coincide exactly with a continuous fluctuating demand or slowing to creep up on a batch-complete set point. 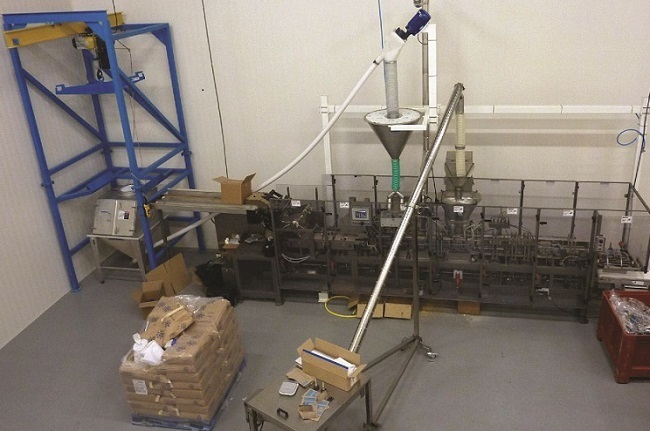 Defining the operation of a feeder consists of determining whether the feeder will be required to deliver in discrete batches or on a non-stop, rate-controlled basis. If batching, it is important to know the amount that must be delivered, the time in which it must be delivered, and what level of accuracy will suffice (usually defined as a plus-minus percentage of the target weight). It is also important to know the idle or at-rest time of the feeder between batches. If feeding continuously, the rate needs to be defined, as well as the accuracy (usually defined as a plus-minus percentage of the instantaneous rate). One of the most frequent conveyor or feeder-size mistakes occurs from confusing material usage with instantaneous demand. While a process may consume 1000 lb/hr of material, the conveyor or feeder may need to transfer at a rate that is 12 times higher if the 1000 batch must be delivered within a five minute window. Most automatic means of feeding and conveying are sized according to the equipment’s volumetric capacity. However, the material demand is most often understood and communicated in terms of its weight. Therefore, a reliable value for the bulk density is necessary in order to calculate the volumetric requirement so that the equipment can be properly sized. 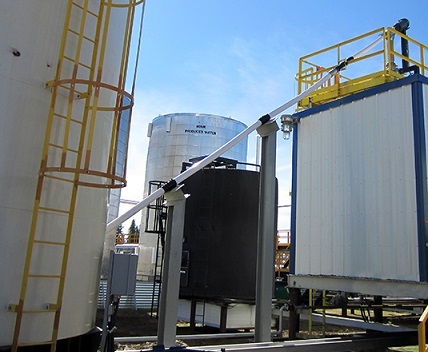 Many environmental factors require consideration when selecting the proper equipment. Some factors may combine with material characteristics to cause, or exacerbate, handling concerns. Other factors may necessitate added health and safety countermeasures. Choosing one conveyor over another often comes down to envelope: How much room is available to install the equipment or device? While this may seem obvious, it is one of the pieces of information that is most frequently omitted from inquiries. The budget plays a part in the feasibility of every project. Justification formulas are different from one business to the next. Some companies prioritize the long-term cost of ownership in their justification calculation – focusing more on reliability, reduced energy consumption and maintenance – while others focus more on the initial investment. When inquiring about potential conveying solutions, always discuss cost with potential suppliers as soon as possible to determine the financial feasibility. This approach will save precious time, energy, and money down the road. When replacing existing equipment, the importance of service history cannot be overemphasized. Where reliability has been an issue, understanding the difficulties can provide important clues that lead to suitable countermeasures. Simply changing brand names is no guarantee that you will end up with a more reliable, longer-lasting piece of equipment. It is far better to provide details about service history and ask the vendor to explain how the proposed conveying solution will provide a more satisfactory result. Proper selection and sizing of a conveyor is critical to successfully meeting production goals. While the number of key factors impacting a conveyor choice can become overwhelming, taking the time to understand these essentials– ideally in partnership with a trusted, experienced supplier – will help you select the best conveying technology for your specific needs. Matching the conveyor to the all of the conditions unique to your process will ensure the best opportunity for a swift return on investment. Joe Zerbel is a senior project manager for Hapman and has more than 25 years of mechanical conveying design and application experience. 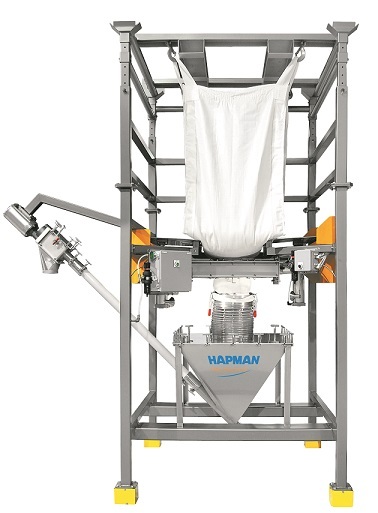 He can be reached at [email protected] Hapman is a global leader in the design and manufacture of equipment and systems for bulk material handling. For more information, call 800-427-6260 or visit www.hapman.com.